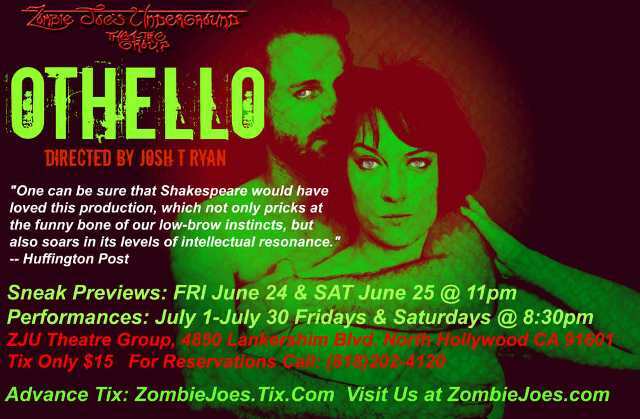 This is Josh T. Ryan and Zombie Joe’s wet n’ wild, high-euro-fashion adaptation of Shakespeare’s tale of love, murder and betrayal, where glamor is a rocky-road and jealousy is a green-eyed monster. Featuring Vanessa Cate as Othello and directed by Josh T. Ryan. June 3 – 18 (11pm), JUNE 3 thru 18, June 20 & 24 at 8:30 pm. ZJU Theatre Group’s special classic edition of their signature horror production returns to dive into the depths of inexplicable horrors, unfathomable monstrosities, and the disturbed spirits that walk among us. Directed by Jana Wimer. Both productions are recommended for ages 15 and up.